Ortlieb Outdoor Gear produces waterproof bags for nearly every outdoor activity. 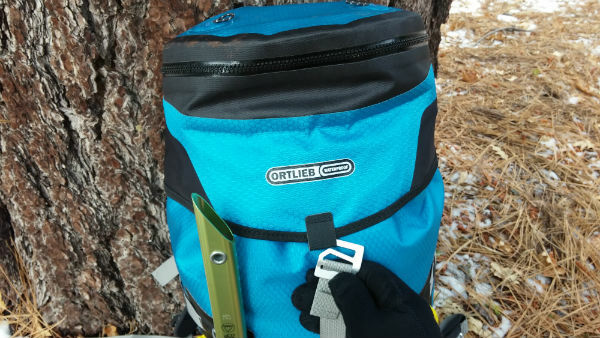 This winter, I had the opportunity to take their newest backpack, the Ortlieb Elevation Pro backpack, on several trips into the mountains of southern California. The Elevation Pro is an alpine-style pack designed for mountaineering, but many of its features are also well-suited to a skiing or snowshoeing over-nighter. 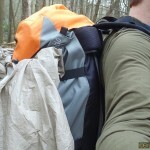 I used the 42L pack, but a 32L version is also available. 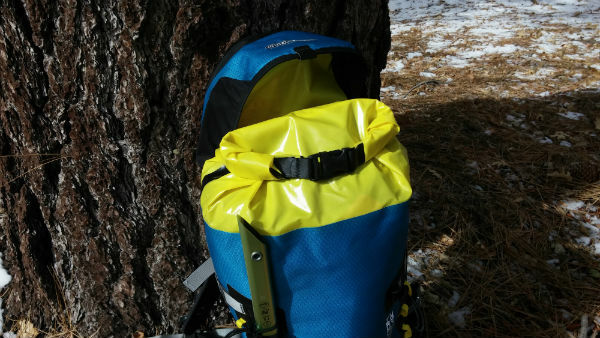 The 2014 Ortlieb Elevation Pro waterproof backpack fully packed with ice axe. Ortlieb achieves this IP rating by manufacturing the bag with PU-coated ripstop nylon and by using high-frequency welding rather than sewing or gluing to eliminate seam leakage. Other features that contribute to the IP rating include a dry-bag roll closure, a waterproof lid zipper, and a hydration tube port plug. To test the waterproofing, I ran my shower over the pack for ten minutes. The main bag remained completely dry inside, as did the lid compartment. I had considered the lid’s waterproof zipper to be the weakest link in the system, but it did its job under direct water pressure. The mesh hip belt pockets apparently were not designed to be waterproof or even water resistant. My 2L Platypus hydration bladder and tube fit the pack’s bladder sleeve and tube port perfectly. 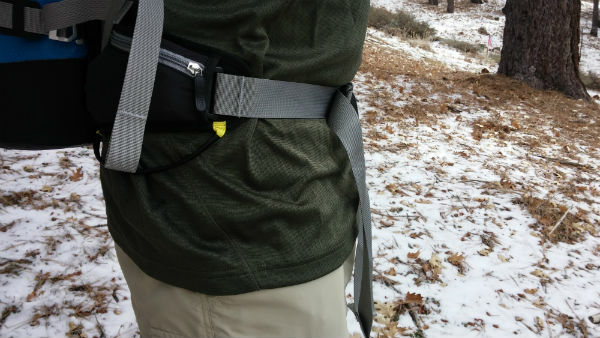 The Platypus tube also fit the hydration tube clips that are on both shoulder straps. One very cool feature is that you can plug the hydration tube port when you’re not using it to keep the main bag watertight. In front of the hydration bladder sleeve is a zippered pocket, and in front of that pocket is another pocket without a zipper. I found these two pockets to be of limited use as there is not much room left inside them once a full hydration bladder is inserted into the sleeve behind them. The rear-facing lid pocket is handy for storing items for quick access. The 2014 lid zipper runs around the rim of the lid, which is an improvement over the 2013 prototype, which had the zipper running across the top of the lid. The variety of external attachment points impressed me. 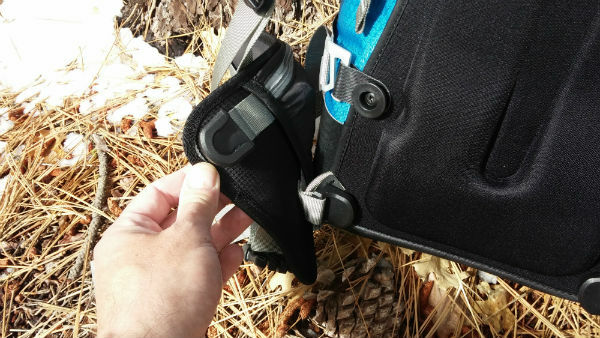 These include four side compression straps, two daisy chains, ice axe fasteners, hip belt gear racks, four loops on top of the lid for the included helmet carrier, and four strap loops on the bottom of the pack for crampons. I particularly liked the metal hooks on the bag closure strap and the side compression straps. They were very easy to use with gloves, which is not always the case with the plastic clips commonly found on backpacks. 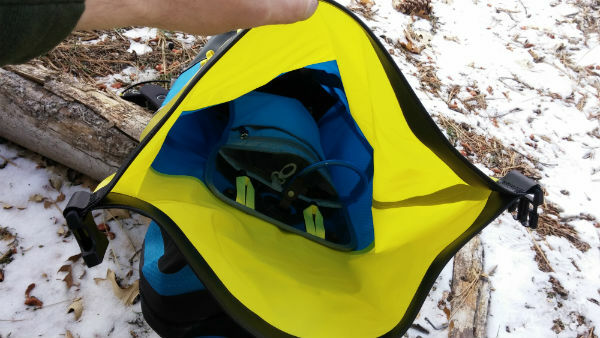 I used the side compression straps to carry my snowshoes, which would have been easier to attach had the straps been a little longer. The straps are 12 inches long and easily fit around skis. The ice axe shaft fasteners were very secure, and I like the inclusion of the pick strap. The Elevation Pro comes in only one torso length and hip belt size, neither of which is specified on Ortlieb’s website. Lucky for me, it fit my 18.5 inch torso and 33 inch waist adequately. 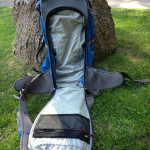 The backpanel measures 20 inches from the shoulder strap attachment points to the base of the pack. The hip belt padding, which is almost like memory foam, came just far enough around my waist to reach my hip bones. I wish the padding were an inch longer on each side. The hip belt strap, on the other hand, was very long for me and could have been shortened by six inches on each side. The hip belt is removable, and the plastic slot attachments make it very easy to detach and reattach. The shoulder straps are 2.5 inches wide and 0.25 inches thick. They are made with dense foam, which is supportive and comfortable even without the use of the hip belt. 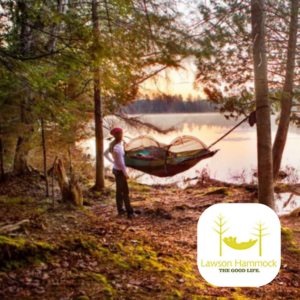 The pack suspension does not include an aluminum frame or stay. It is essentially frameless. There is a flexible plastic plate behind the shoulder blades and a molded backpanel that is fairly comfortable. 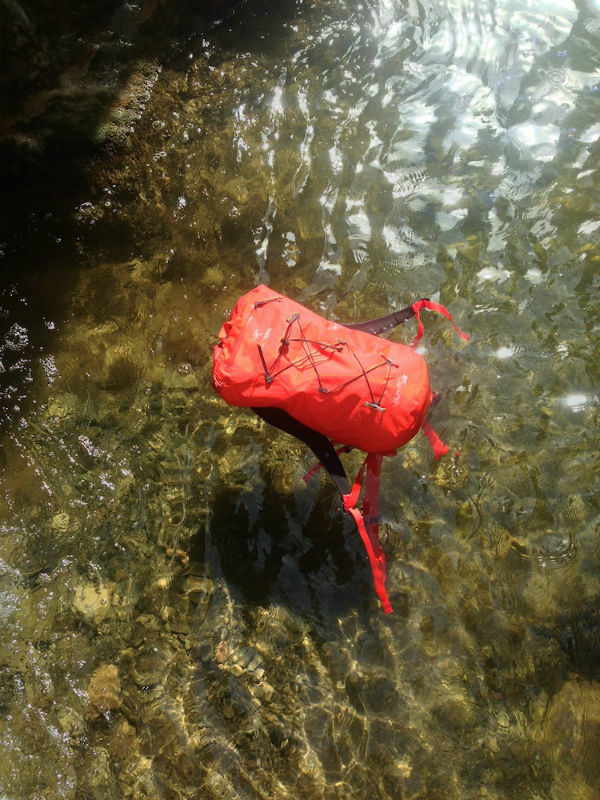 Overall, I found the pack to be comfortable, and it was easy to control the load while scrambling and jumping. 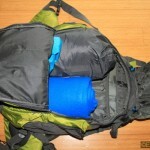 I carried various loads in this pack and would say that the maximum comfortable load is 35 pounds. 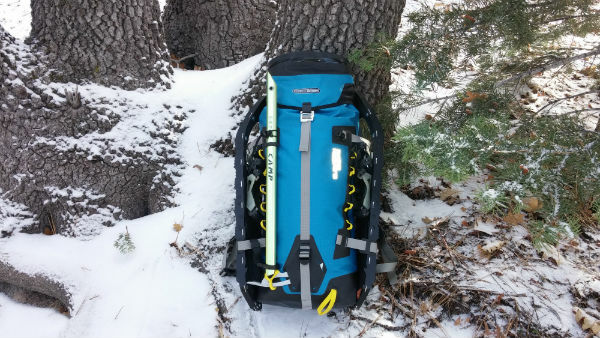 Anyone needing a relatively lightweight, waterproof pack with lots of external attachment points for technical gear should consider the Elevation Pro. Just make sure that the torso length and hip belt give you a proper fit. MSRP: $350 for 42L version. Actual Weight: 52 oz. (includes 8.8 oz. hip belt and 0.6 oz. helmet carrier). Materials: PU-coated PS42R ripstop nylon. PVC free. Dimensions (HxWxD): 27.6 x 12.6 x 12.2 in. Andrew lives in southern California. 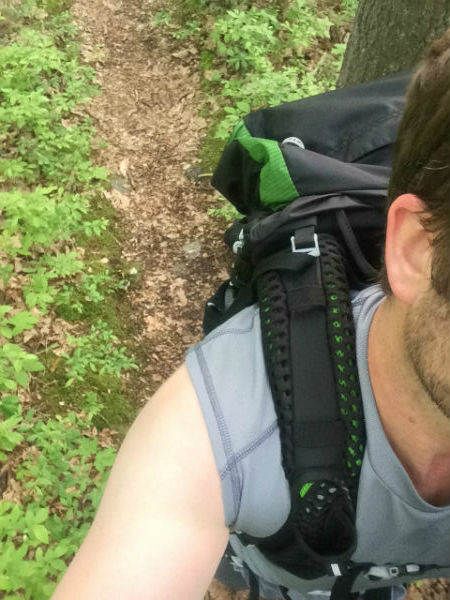 He has thru-hiked the Pacific Crest Trail and the Arizona Trail. His Twitter is @mccartermobile. His blog is sub-10.blogspot.com.